The premise of this story is simple (skip this if you want to go in like I did without knowing anything about the story). 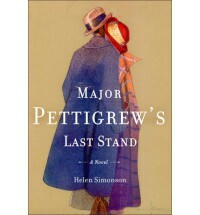 Curmudgeon Major Pettigrew finds out that his brother has just passed away. His neighbor Mrs. Ali had just happened to swing by that day in order to collect newspaper money and takes the opportunity to comfort him. Her sweet gesture of condolence eventually leads to cute old people love. However, since they live in a tiny conservative village, many look down upon their newfound love, since Mrs. Ali is of Pakistani descent.